We’ve seen how many frequencies can combine to produce a complicated waveform. 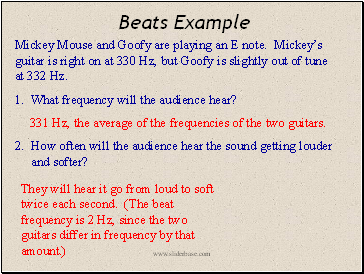 If two frequencies that are nearly the same combine, a phenomenon called beats occurs. The resulting waveform increases and decreases in amplitude in a periodic way, i.e., the sound gets louder and softer in a regular pattern. 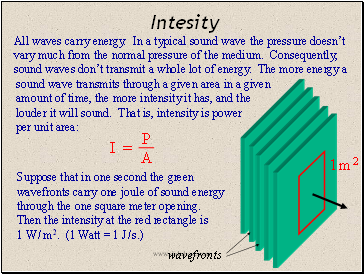 Hear Beats When two waves differ slightly in frequency, they are alternately in phase and out of phase. Suppose the two original waves have frequencies f1 and f2. Then their superposition (below) will have their average frequency and will get louder and softer with a frequency of | f1 - f2 |. Mickey Mouse and Goofy are playing an E note. Mickey’s guitar is right on at 330 Hz, but Goofy is slightly out of tune at 332 Hz. 1. What frequency will the audience hear? 2. How often will the audience hear the sound getting louder and softer? 331 Hz, the average of the frequencies of the two guitars. The more intense a sound is, the louder it will be. Normal sounds carry small amounts of energy, but our ears are very sensitive. 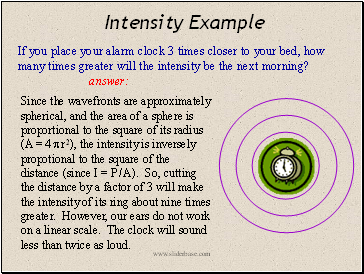 In fact, we can hear sounds with intensities as low as 10-12 W / m 2 ! 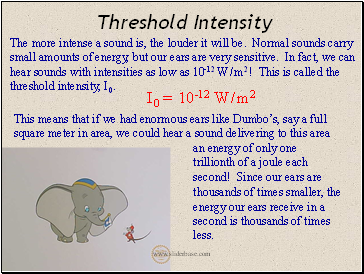 This is called the threshold intensity, I 0.
thousands of times smaller, the energy our ears receive in a second is thousands of times less.